If You’re CNN, Which Do You Choose? The Brand or Ratings? CNN has seemingly chosen to sacrifice a bit of its brand in favor of scooping up viewers who are interested in anything and everything about the missing Malaysia Airlines flight. CNN’s ratings got a boost from coverage of the missing Malaysia Airlines flight that has been called both “breathless” and “speculative.” In the process, its reputation has taken a hit. The AP noted in mid-May — the point when CNN’s round-the-clock reporting of MH370 was hitting a fever pitch — that various shows on the news network had seen a spike in viewership. One Thursday, programming reached 588,000 viewers where they usually reach 320,000. And Anderson Cooper, who would usually have 444,000 people watching his program, was reaching numbers closer to one million. However, YouGov BrandIndex data shows that perception of the network (and HLN) had dropped in the first three months of this year after reaching near highs at the end of 2013. So to get those bumps in eyeballs, the network had to sacrifice a piece of the brand’s perceived quality. The question is whether it’s worth it. We couldn’t imagine trying to fill 24 hours of news coverage, but no matter what, there has to be a standard by which a network abides by. CNN did away with that entirely for this story. One correspondent, Martin Savidge, spent so much time in a flight simulator that a hashtag, #freemartinsavidge, started on Twitter. It’s reported that the network sought to rent an actual airplane and when they couldn’t, they booked the simulator to keep other networks from it. Other networks have called them out on it. 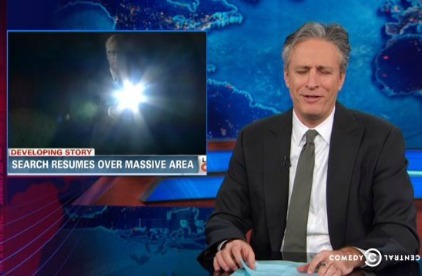 And Jon Stewart went to town on it, mocking the holograms, the screwball theories and the all-around lunacy of trying to squeeze every iota of nothing out of this story. CNN, it appears, gave up on the idea of actually gathering and delivering the news in favor of gathering and delivering ratings. In this case, there’s a difference. CNN’s legitimacy — which has been questioned before, for instance, in its problematic and sometimes erroneous reporting about last year’s Boston Marathon bombing — is once again being questioned because of its reliance on stunts and speculation. One person who has jumped to CNN’s defense is Fox’s Greta Van Susteren, who said, “Do you really think, if CNN had not done so much coverage, with its big platform, that Malaysia, Australia and even our own country would have gone the extra mile looking for that flight?” Perhaps. But that’s not why CNN was doing this coverage, which is the reason so much of it went off the rails. What goes up on the screen — and ultimately, the network’s reputation — is affected by the intent of its coverage. This morning, a look at the homepage showed two “Breaking News” alerts, both about the missing plane: one about newly-detected signals, the other about the pilot being the last person to speak with air traffic controllers. One of those — about listening for signals from the plane — was still marked as breaking news at 12:30pm. Sigh.